All travel services in Cambodia and Southeast Asia countries. Siem Reap Town is where you will stay during your visit to Angkor. The area has been receiving foreign visitors to the temples for over 100 years. The town is actually a cluster of old villages, which originally developed around individual pagodas, and later overlaid with an French colonial-era center. Note the colonial and Chinese style architecture in the town center and around the Old Market. Nowadays, Siem Reap offers a wide range of hotels, restaurants, pubs and shops including several upscale hotels and dozens of budget guesthouses. Often missed are the many opportunities to experience traditional Cambodia: ‘Apsara’ dance performances, craft shops and silk farms, road tours through rice-paddy countryside, boat trips on the great Tonle Sap Lake to fishing villages and bird sanctuary, and much more. The celebrated temples of Angkor are Cambodia's greatest tourist attraction. The 100 or so temples are the sacred remains of what was once a much larger administrative and religious centre, and were built between the 9th and 13th centuries to glorify a succession of Khmer kings. 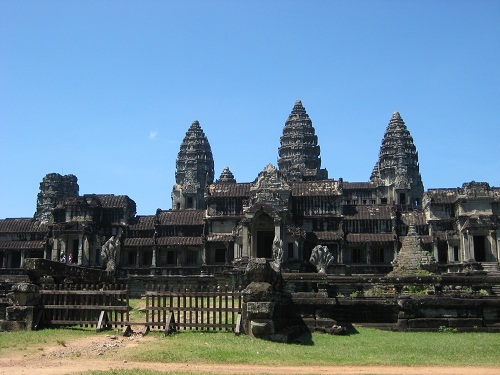 The three most magnificent temples are Bayon, Ta Prohm and the immense Angkor Wat. Most of Angkor was abandoned in the 15th century and the temples were gradually cloaked by forest. The site became the source of scholarly interest in the late-19th century after the publication of "Voyage à Siam et dans le Cambodge" by French naturalist Henri Mouhot. Efforts were undertaken to clear away the jungle vegetation that threatened to completely destroy the monuments, and restoration continues today. A mixture of Asian exotica, Indochinese charm and Cambodian hospitality await the visitor to Phnom Penh. Situated at the confluence of three great rivers - known as "Chaktomuk" (four faces) of the Mekong, Tonle Sap and Bassac rivers - Phnom Penh is the capital city of Cambodia and the country's commercial, economic and political hub of Cambodia. It is also the gateway to an exotic land the ancient temples of Angkor in the west, the beaches of Sihanouk Ville and Kep on the southern coast, the ethnic minority people, jungles and wildlife of Ratanakiri and Mondulkiri provinces in the northeast and a wide-open, unspoiled countryside of rice paddies, little villages and lost temples across the country just waiting to be explored. 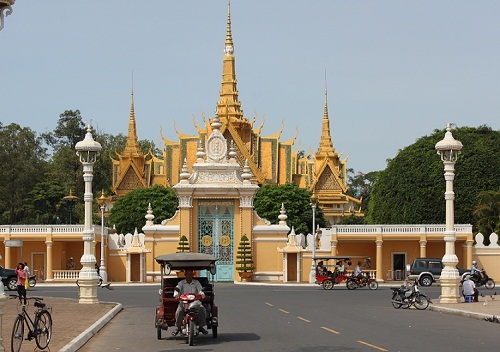 Phnom Penh City has several cultural and historical attractions including the Royal Palace, Silver Pagoda, National Museum, Wat Phnom, Toul Sleng Genocide Museum and the Killing Fields. Other historical sites such as the old capital of Oudong and the Angkorian ruins of Phnom Chisor and Phnom Da lie within an easy day-trip of Phnom Penh. The city also offers a full compliment of visitor services and facilities including accommodations ranging from five-star hotels to budget guesthouses, some of best restaurants and dining in Southeast Asia, a vibrant all-night bar and entertainment scene, and a unique and varied array of shopping opportunities including traditional Asian markets, silk shops, art galleries and stylish Euro-Asian boutiques. 'Beach town', 'port community', 'fledgling resort destination' - all describe Sihanouk Ville, Cambodia's premier beach town. Sihanouk Ville's white sand beaches and warm Gulf of Thailand waters combine with a laid back, beach atmosphere to provide a great little tropical getaway. Sihanouk Ville is a place to unwind by the beach, enjoy the fresh from-the-ocean seafood, take in a snorkeling or scuba trip, and generally slow-down, lay back and chill-out. Sihanouk Ville has a different look and feel than most Cambodian towns. Constructed as a port city in the late 1950s, the town is much newer, more urban and cosmopolitan than most Cambodian provincial cities. Nowadays, Sihanouk Ville is as much a beach town as it is a port town, catering to beach-going weekenders from Phnom Penh as well as a steadily increasing number of foreign visitors. Still, the pace of life in Sihanouk Ville is very relaxed. Cows occasionally wander the main road, outside town foreign faces draw smiles and curious stares, and most of the beaches offer only beach umbrellas, thatched roofed eateries, and a growing number of restaurants, bungalows and hotels. 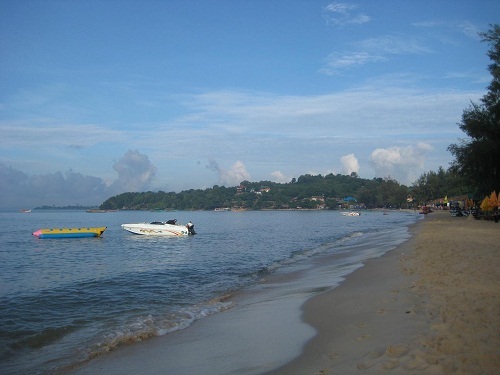 Sihanouk Ville has a more than ample supply of accommodations, including a 5-star resort complex on Sokha Beach, several mid-range places downtown and at the beaches, a few 'upscale' three-star hotels, and dozens of budget guesthouses, especially on Weather Station Hill (Victory Hill). Considering the moderate number of visitors to Sihanouk Ville, the town offers a surprising number and variety of restaurants and bars. 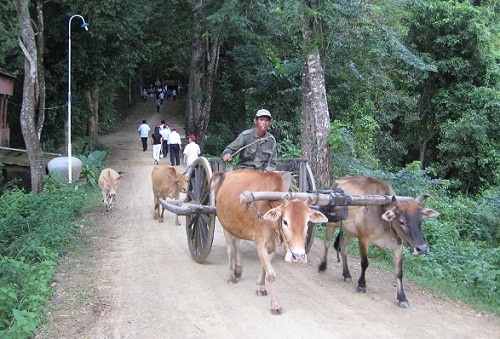 Similarly, as you leave Battambang by road, the scene quickly becomes one of small villages, rice paddies, and farmland, offering an excellent opportunity for the visitor to see a bit of 'unspoiled' rural Cambodia. The nearby countryside also harbors old pagodas, Angkorian era ruins, caves, waterfalls, and even Khmer Rouge period killing fields. Battambang means ‘disappearing stick’, and is named after a powerful stick used by a legendary Khmer king to achieve and maintain power in the Battambang area. 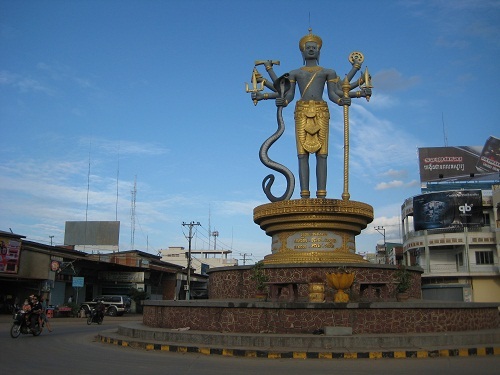 Banlung City is the provincial capital of Ratanakiri Province in Cambodia's mountainous northeastern corner. Heavily jungle and home to 12 different 'Khmer Loeu' ethnic minority groups, Ratanakiri province has a real edge-of-the-world feel to it. Most visitors to Ratanakiri base themselves in Banlung City from where they make excursions/treks to Khmer Loeu villages and jungle areas, waterfalls, gem mines, and Ratanakiri's famous Yeak Laom volcanic lake. The city of Banlung is fairly small but offers some interesting shopping and a few decent hotels. It is one of two major forms of Khmer dancing, and incorporates parts of the other - much older traditional or popular dancing, which has its roots in animism and primitive magic -with Hindu forms introduced during the time of Indian influence beginning in the 1st Century. Classical dance took on its own unique form, adding movements and meaning, during the reigns of kings Jayavarman II to VII. By the 13st Century, it was more Khmer than Indian, unlike any other dance form in the world. At the heart of the classical form is the Apsara, the joyful, almost wanton dancer whose images are everywhere Princess Buppha Devi is a master of Apsara dancing, which dates to the 1st Century. The graceful movements of the Apsara dancer, adorned with gold headdresses and silken tunics and skirts, are carved on the walls of many of the temples at Angkor. Estimates are that there were 3,000 apasara dancers in the 12th Century court of King Jayavarman VII. Over the centuries Khmer dancing lent its influence to the classical ballet of neighboring countries and some of its postures and movements are similar to other Southeast Asian dance forms. But according to Princess Buppha Devi, "The Khmer Kingdom started its traditions in the 8th century, 500 years before Thailand." In 1400, with the sacking of the Angkor Empire, the Apsara dancers were seized and taken to Thailand. Apsara dancing is one of two elements of classical ballet, the other being "tontay" dancing, the depiction of early myths. Many of the dances involve performing a fragment of the Ramayana, the ancient Indian epic that is one and a half times as long as the Odyssey. Others are based on the legendary battles and mythical sagas carved in bas relief in the walls of the temples of Angkor-including the Churning of the Ocean of Milk, the great battle between gods and demons for the holy liquid that gives immortality. There are some 100 Cambodian dances and dramas. There are four typical roles in Khmer dancing -the male, the female, the monkey and the giant. Women and girls usually play the male and female and giant roles. Males often play the monkey role. In the early days, all dancers were women, and females still dance most of the roles in the Royal dance troupe today. Copyright © 2011 Phuong Nam Star Cambodia. All rights reserved. Picture Window theme. Powered by Blogger.